Which Bimini for a VLX with Illusion? We are still working on putting our VLX together and this time we have a question about the bimini. We were thinking about getting the kind that you see on the Responses or Sunsetters as opposed to the one standard on the Illusion X. Some people think it would be better when it´s raining or when it´s cold. Supposedly, you can attach the bimini to the top of the windshield which should offer better protection when it´s cold or rainy. Is this true? Anyone try out both of these Bimini or have any advice for us? Something like these (only more stylish and matching, etc). Anybody know where I can get one of those? But seriously, I´m sure the thing is great in the sun and better than the other bimini and looks better, but it seems almost worthless in Rain/wind. If it is raining and windy my Bu does not come out of the garage, do you really take yours out when the weather is bad? You better believe it! It rains here alot, so we just try and make the most of it. No "sunny boys" here! We have been in the rain many a time. But maybe I should correct the word "wind". I think I was refering to cold air while driving the boat during cold days early in the year and not necessarily stormy weather. Sorry for the confusion. If it is to windy, then no, we don´t go out. I think I was refering to cold air while driving the boat during cold days early in the year and not necessarily stormy weather. You are correct in that the standard Bimini won't help much for rain or cold wind. We've found that driving with the heater on and the bolster seat down with the seat pulled forward allows for good protection from the wind. (The windshield actually does a pretty good job! ) The standard Bimini is one of my favorite parts of the Illusion X tower. I've left mine up the entire summer - even when traveling and haven't had a problem. Being able to walk under it without ducking is worth the price of admission. The standard Bimini is one of my favorite parts of the Illusion X tower. I've left mine up the entire summer - even when traveling and haven't had a problem. Being able to walk under it without ducking is worth the price of admission. I agree. Its the standard bimini that sold me on the tower. Another vote for the standard Illusion bimini. Although it's high so offers a little less shade, everything else about it rocks. Due to that height, it offers much more room to walk under than most bimini's. It's also taught like a drum, and can withstand much higher wind speeds than a typical bimini. Like Keith, I never took the bimini down all summer long! You should try and get someone over there to make a copy of the standard bimini but a bit larger like they have here in AUS. It comes down the sides of the tower a couple of inches more than the US version and it gives a little more coverage at the rear than your extended version. And it still folds up on top of the tower when not required. Gotta go with the factory Illusion X bimini. It's impressive! 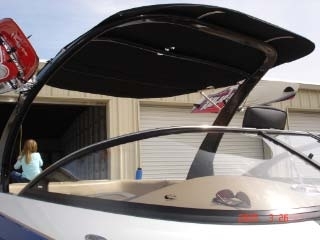 As others have said it won't protect you from wind or rain, but with that said I've not seen anyone ever do a bimini that attaches to the windshield on a wakeboard boat, unless you count that one crownline with the tower! I/O's are known for that kind of bimini top. One that attaches to the windshild, we used to have one on our old Mariah, and it did a great job of inclosing the cockpit and keeping everyone warm and dry. I'm sure you could have one made that works that way, but you will be big time limited in "interior" space with it up. I guess it all depends on what is most important to you. We have the extended bimini from Malibu on our LSV/IllusionX. We're really pleased with it. It is about 2' longer than the standard one and $250 more. Worth it for the hot summer sun in the central California valley. If it rains, we don't go out as it is rarely warm and rainy here. Another vote for the Illusion standard bimini. It's by far the sturdiest bimini on the market the head room can't be beat. 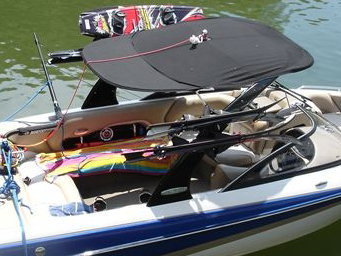 Is the extended bimini an add-on, or do you have to order it right off the bat? 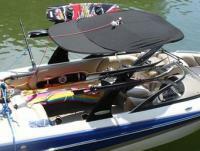 Is it necessary for the VLX, or is it really made for the LSV because of the boat being longer? It's an add-on that you can get at any point. I almost ordered one with the boat, but at the last moment decided against it. I figure that I can always choose to spend that money later if I decide that I really need it. From what I've read it can inhibit entry to the VLX from the rear & that it really works better on the LSV because of the length, which was why I decided to wait & see how the bimini works without it. I´m glad it´s an add-on! We´re pretty broke right now after ordering the boat and we don´t even have a sound system yet. Guess we can order it later if we find out that wereally need it. Yeah, spend the winter making a list & checking it twice, & by spring you'll have plenty of things to spend money on. With the extension, I'd get some time in the boat on days when you actually use the bimini before deciding that you need it. Looking for bimini that covers entire back area for the 247?? Anyone add a second bimini to cover entire seating area?